For the first time since he became president, a significant number of Americans are expressing disapproval of Barack Obama's actions in a specific area: His handling of the AIG bonus situation. Despite the middling reviews for his handling of the bonuses, however, the president continues to get high marks overall for his job performance and his handling of the economy. Forty-two percent of those surveyed disapprove of the president's handling of the AIG bonuses, while roughly the same percentage - 41 percent - approve. Another 17 percent don't know or aren't sure. What Do You Want CBS News To Poll About? Let us know! 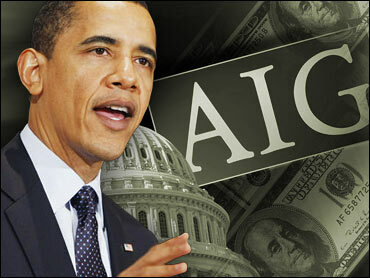 Yet President Obama's overall job performance rating appears unaffected by the AIG fallout. Sixty-four percent approve of the president's performance, roughly the same as last week. And ratings for the president's handling of the overall economy are actually up slightly: Sixty-one percent now approve, up from 56 percent last week. The poll numbers can be explained in part by the fact that most Americans do not think there was much the Obama administration could have done about the bonuses. Only 12 percent think the administration had a lot of control over the payouts, while more than half say the administration had little or no control. Even so, 56 percent of Americans say the administration ought to have found some way to stop the bonuses from being paid out. Thirty-four percent said it should not have. An overwhelming majority of Americans - 83 percent - say AIG could have found a way not to pay their employees bonuses. The company has argued that the bonuses were agreed to it ran into financial trouble, and that contracts legally required them to pay them. As we reported Monday morning, more than three in four Americans think the government should try to recover the bonus money paid by AIG. Only 15 percent believe the company should get more government assistance to avoid bankruptcy. And just 23 accept the argument from some in the financial industry that the bonuses are necessary to hire and retain employees. Anger over the bonuses, which have led to death threats for AIG employees, is widespread. Half of Americans say they are "angry" about the bonuses, while another 38 percent are "bothered" by the situation. Just 12 percent say they are not bothered at all. And despite reports that some AIG executives are returning their bonuses, most Americans - 69 percent - think few or no employees will actually give some of the bonus money back. Asked if companies receiving federal bailout money should be awarding bonuses to their employees, 65 percent said such a move is unacceptable. Another 26 percent said it is acceptable to give bonuses only to mid- and lower level employees; just six percent think said bonuses should be given to whomever the company chooses. Americans are split on a House bill to tax the bonuses at 90 percent, a measure passed in the wake of last week's populist outrage at the situation. Fifty-one percent approve of the legislation - which the Obama administration appears to be backing away from - while 44 percent disapprove. Nearly half of Americans say President Obama is spending the right amount of time dealing with the bonuses, and the rest are split on whether he is paying too much attention (24 percent) or too little attention (21 percent) to the issue. Meanwhile, a majority of Americans - 53 percent - think Congress is spending too little time trying to solve the nation's broader economic problems. And 40 percent believe the media is too focused on AIG and that they should be spending more time focused on other issues. Fifty-seven percent of Americans are closely following the bonus story, and another 29 percent have heard or read something about it. Just 14 percent have heard not much or nothing at all about it.